By Air : Agra is one of the up-to-the-minute tourist destinations in India. It has its own airport which connects Agra with all the major places in India. The Agra airport or the Kheria airport has all the major domestic airlines having their services. By Rail : Agra is one the major railway station with almost all the trains to south India. Agra city is visited by the "Palace on Wheels" .The Rajdhani and Shatabdi trains have also their stoppage in Agra. The city is well connected by trains to almost every corner of the nation. By Road : Agra has the one of strongest networks of roads including National Highway Numbers 2, 3, 11 passing through it. The state transports have deluxe as well as ordinary bus services for the place. The state government conduct tours which take tourist not only to Agra, but the nearby tourist spots too. The Agra is the city of love with impedance of love called - the Taj Mahal. Taj Mahal was constructed by the Mughal Emperor, Shah Jehan. 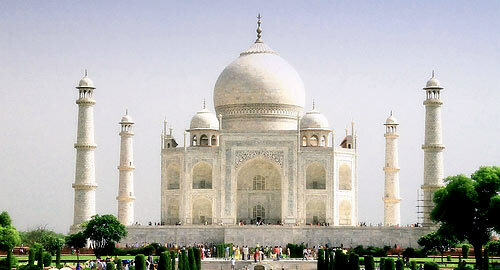 It is said he built this monument in the memory of his beloved wife Mumtaj Mahal. The Taj Mahal is insubstantial at any part of the day - blushing in the rosy glow of dawn or sunset, appearing like a pearly mirage in the moonlight or reflected in the pools of the garden. Agra, the city of Taj was established in 1475 by Badal Singh. Agra finds mention in the Mahabharata as Agraban. Agra city in those days was considered to be the sister city of Mathura which was more prominent than Agraban. Agra came into its own when the Lodhi Kings choose this place beside the Yamuna to be their capital city. Sikander Lodhi made Agra his capital but Babar defeated the Lodhis to capture not only Agra but also laid the foundation of the Mughal Empire. The coming of Babar heralded a new era which was to see Agra at its zenith during the reign of Akbar, Jahangir and Shah Jehan. It was during Akbar's period that Agra became the center of art, culture and commerce and learning. This trend reached its height when Shah Jehan became the ruler. Taj Mahal: The Taj Mahal built by the Mughal Emperor Shah Jahan as the final resting place for his favourite Queen, Mumtaj. Finished in by Marvel, was built in 1653 AD. it is perhaps India most fascinating and beautiful monument. This perfectly symmetrical monument took 22 years (1630-1652) of hard labor and 20,000 workers, Masons and Jewelers to built and is set amidst landscaped gardens. Agra Fort: The great Mughal Emperor Akbar commissioned the construction of the Agra Fort in 1565 A.D., although additions were made till the time of his grandson Shah Jehan. The forbidding exteriors of this fort height an inner paradise. The fort is crescent shaped, flattened on the east with a long, nearly straight wall facing the river. Itmad-Ud-Daulah: tmad-ud-Daulah is the tomb of Mirza Ghyas Beg, a persian who had obtained service in Akbar Court. The Marvel tomb was made by Emperor Jahangir’s Queen, Noorjahan, for his father Mirza Ghyas Beg during 1622-1628 A.D.
Fatehpur Sikri: Fatehpur Sikri is an epic in red sandstone. A city of yesteryear today lost in the mists of time. Fatehpur Sikri was built by the Mughal Emperor Akbar during 1564 A.D.. Mughal Emperor Akbar had no heir. He visited holy men to enlist their prayers for his son. Taj Mahotsav: The time of the year when nature dawns all its colourful splendour and Agra bursts into colourful celebrations. For 10 days there is sheer celebration of U.P. 's rich heritage of arts, crafts, culture, cuisine, dance and music takes place in the month of February. There are festivities all around and Agra truly puts on the colours of joy and gets transformed into one non-stop carnival. Organised by U.P. Tourism and held as an annual event at Shilpgram, literally next door to the Taj Mahal, the Taj Mahotsav is indeed a fitting tribute to the legendary skills of master craftsman and other exponents of art, music and cuisine. The city of Agra has a equal ratio of both Hindu’s as well as Muslim community. As such there are a number of mosques and temples in the city. Some of the mosques and temples are real attractions due to their historical importance. The Mughal kings have left their landmarks behind and some as historical worshipping places. Moti Masjid, is renowned in the city because of its beautiful architectural design. Likewise there is Jama Masjid which has been providing service since long. Akbari Masjid is one more important worshipping place for Muslims. Besides mosques there are many temples located in the premises of Agra city. Radha Swami Samadhi: This is the head quarter of Radhaswami religion, here the holy ashes of the founder of the faith have been preserved. On the sprawing lawns here, is a beautiful marvel temple with beautiful carving of fruits, flowers, leaves and plants which have been reduced into stone true to nature, and are distinctive speciments of the plastic arts. This is under construction for almost 100 years. When it comes to visiting AGRA and Taj Mahal, there is no such thing called best time and worst time, because the offers a different perspective to all the visitors all the time. Though the best time would be Winters in the months of October to March, when days are warm and sunny and ideal for sightseeing. Agra is located on the Yamuna plain and has a continental climate, with very hot summer weather and cool winters. In summer (April to September) temperatures can reach as high as 119F (48C) and dry winds prevail. The annual monsoon season is between July and September. Winters temperatures (November to February) are comfortable at about 57F (14C) during the day but may fall below freezing at night. Agra experiences dense fog during the winter months of December and January. The city of Agra is dominated by Muslim and Hindu population. The region as such celebrates the popular festivals as occurs in these faiths. The popular Muslim and Hindu festivals are celebrated in the region with the same enthusiasm as that of the rest India. Important Muslim festivals include Eid-ul-Fitr, Eid-ul-Adha and Moharram. Hindu population celebrate Holi, Ramnavmi, Janmashtami, Ramlila, Dussehra, Diwali. Apart from popular festivals the residents also celebrate local fairs and festivals. The local festivals like Taj Mahotsav, Bateshwar Fair, Kailash fair and Rambarat are celebrated with great fanfare and pomposity. Taj Mahotsav is celebrated in the month of February at Shilpgram which is about one kilometer from the Taj Mahal. The celebration is a good occasion to see and hear the traditional performers of the region. There is display of traditional crafts and arts during the occasion. Bateshwar fair is celebrated in the month of October and November. Associated with the fair is livestock trade and various temple offerings. The Kailash Fair is held at Kailash, which is about 12 kms from Agra. The fair is celebrated in the honor of Lord Shiva. Rambarat is celebrated to pay homage to the wedding ceremony of Lord Rama. During this festival which lasts for 10 days plays based on the sacred book of Ramayana are enacted. The foods in Agra bear the impressions of the mughal kings. The mughal kings must have had a great appetite for food besides arts and literature. The Mughlai cuisine seems to have left the dining tables of the mughal courts and into the city at large. The great connoisseurs of Agra had a liking towards flesh. The meat dishes served all over Agra are the speciality and serves the best Mughlai cuisine in India. The baked meat, bread and chicken are the best in the menu. Kababs which are made by baking meat in an earthen oven called tandoor is one of the most delicious things offered in Agra. Tandoori Chicken and Tandoori Fish are other specialities. Dalmoth and Petha are popular sweets of the region. Capri restaurant(Hari Parbat) , Dasaprakash(antonment area of Agra), Jharokha-e-Taj(the road to the Taj Mahal), Sheesh Mahal, Nauratna restaurant(the way to the Taj Mahal), Noorjehan restaurant.